The name is new. . .
MRC Concrete Polishing may not be familiar to you but we are not a startup. For nearly 10 years we have been gaining experience and perfecting the methods we employ under our sister company Mr Clean Maintenance Systems, a leading floor maintenance company in Southern California. We have accomplished the research and development to produce one of the most durable and beautiful of floor finishes. Over 1000 hours were invested in testing the various methods, materials and equipment used in concrete polishing so that you can have the confidence that your concrete polished floor will be of the highest quality for the most reasonable price. We believe in the concrete polished floor. It is the most favorable of commercial floors because it is the most sustainable of floors. Whether for new construction, a remodel project, restoration of existing floors, MRC has the expertise to respond. Go to our Gallery to see some examples of our work. MRC Concrete is a division of Chiro, INC., an employee owned company. Polishing refers to the process that will take a dull, maybe sealed or even rough concrete surface and transform it into a beautiful, smooth, and quality polished concrete floor. This process includes several levels of grinding, applying of densifiers and sealers, burnishing then finish buffing. It may also include coloring of the concrete adding to its character and beauty. The Restoration process may be required for an existing Polished Concrete floor that has over time experienced a large amount of degrading of its polished quality. Or it may be needed in response to a poorly polished concrete floor that did not hold its quality and beauty. In either case the process requires deep grinding, densifying, burnishing, sealing and buffing of the concrete. Refresh an existing Polished Concrete floor is a process also known as revitalizing. This process addresses an already polished concrete floor that has experienced some dulling due to the wear of traffic. This process includes light grinding, reapplying of densifier, re-burnishing, sealing and rebuffing of the concrete floor. Why choose a polished concrete floor instead of vinyl, tile or wood? Everyone loves and admires beauty. The more natural the material the more beautiful it is and so the more it is appreciated. This is why a polished concrete floor has become one of the most appreciated types of finished floor materials. Though concrete is known for its strength and is identified as the material of choice for structural elements as in roads, buildings and walls it has also holds a natural beauty because By using the proper methods the concrete’s natural beauty which can be brought out using proper methods. When we speak of Quality we are not simply speaking about the finish or shine of the polished concrete floor. Quality encompasses durability and sustainability of the floor’s finish and shine. How long the floor’s finish remains before intensive restoration is required. The quality of our polishing process will not only result in a beautiful finish but will greatly increase the time before major restoration of the finish is required, thereby lowering maintenance costs to you. Once beauty and quality is achieved maintaining a concrete polished floor needs to be easy using an efficient, systematic approach. Simplicity is maintaining a beautiful polished concrete floor using the proper materials, the proper equipment and properly trained people. It is making the nominal investment of time, materials and energy to retain the maximum beauty and quality. A Polished Concrete floor is one of the best GREEN solutions to assisting in a project’s LEED certification. Sustainability of a Polished Concrete floor and its part in Energy optimization also contribute to making it a floor of choice in LEED certification. In comparison to other hard floor coverings such as VCT or sealed concrete, Polished Concrete floors have demonstrated increased Coefficient of Friction (COF) both when dry and when wet, greatly reducing the potential of slips and falls. 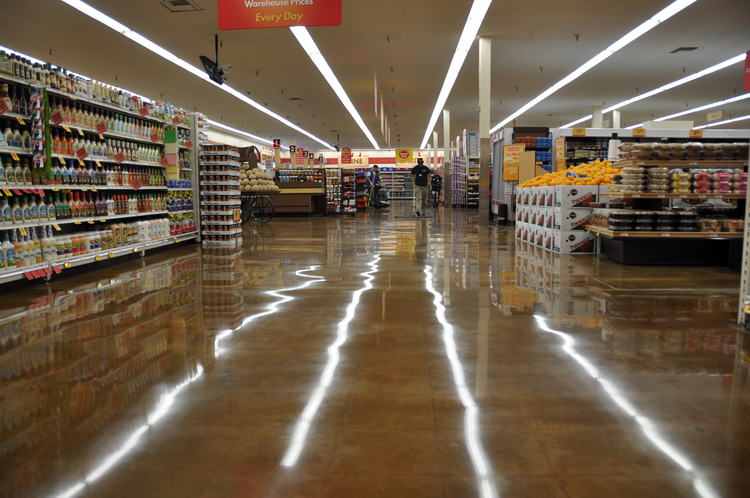 Concrete Polishing reduces the use of adhesives and finishes that are high emitting materials. The sealers and densifiers used to produce and maintain a Concrete Polished floor are low-emitting and can add points in the EQ Credit 4.1 category of LEED certification. The energy efficiency of concrete is well documented. The thermal mass qualities of a Polished Concrete floor can reduce the heating and cooling loads of a building envelope. This also will credit the project in LEED points. If you have other inquiries please use this form and a representative will get back to you.